I have been quietly grinching to myself that all the muffins for Muffin Monday have been sweet lately and we all know I don’t eat sweets very much. Not for dietary reasons, goodness knows, but because I prefer savory. I’ll take a greasy sausage over a piece of chocolate cake any old day. But with this week's recipe came the perfect opportunity to bend the muffin my way. A cornbread muffin! Which can totally become savory! But my sister is here in Cairo visiting and when I said, “Yay! It’s a honey cornbread muffin so I can take out the honey and add cheese or something,” she responded, “But a HONEY muffin! Why can’t you just make it?” Because sweet is her thing. So I made these honey thyme muffins for her. And she cut them open and drizzled them with EVEN MORE honey. And declared them good. Adapted from a recipe from Down Home with the Neelys. Preheat oven to 350°F or 180°C and grease your 12-cup muffin tin or line it with paper liners. Mix your cornmeal, flour, baking powder, sugar and salt into a large bowl. Add in your fresh thyme leaves and stir well. In a small bowl, whisk together your yogurt, eggs, melted butter and honey. As always, please allow your helper to clean out the yogurt pots. 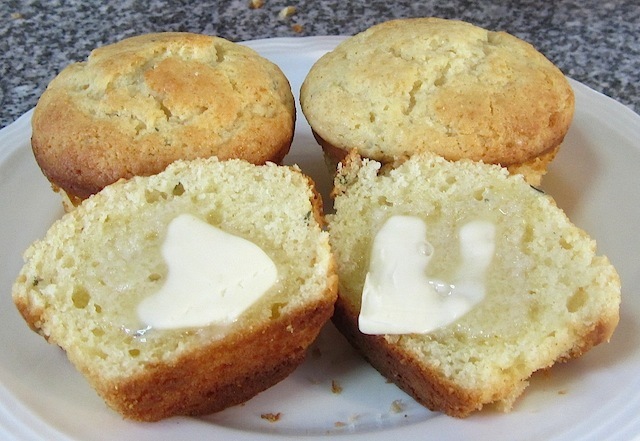 Divide the batter evenly between your muffin cups. Bake in your preheated oven for 20 minutes or until they are a nice golden brown. Allow to cool briefly and then remove the muffins to a rack. These are delicious warm, plain or slathered with extra butter and/or honey. So good to know you're sister enjoyed them too! Adding thyme was a great idea. Thanks, Anuradha! The thyme was subtle but added a nice touch. I am looking forward to those savory ones! I am with your husband! Add jalapeños or better yet, cheese and jalapeños and I am your muffin friend forever. A lot of thyme probably wouldn't have worked but just a teaspoon was lovely. It was a background note to the honey and cornbread. You need to make Sheila's Mexican Cornbread (search this blog) for MrL! It is nothing short of OMG.